Figure A. 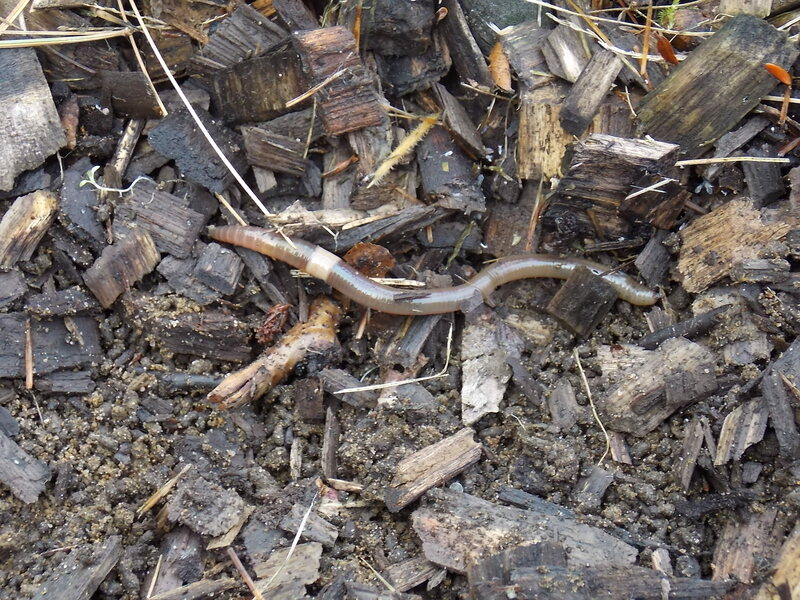 1 Crazy Snake Worm (Amynthas agrestis) in the wood mulch of a horticultural bed at a tree nursery in Vermont. Checkout the white ring around the worms body. In Amynthas species it stretches all around the body and it is well off-set from the rest of the body. The Crazy Snake Worm (Amynthas agrestis, Figure A1) is an aggressively invasive earthworm that hails from Korea and Japan. 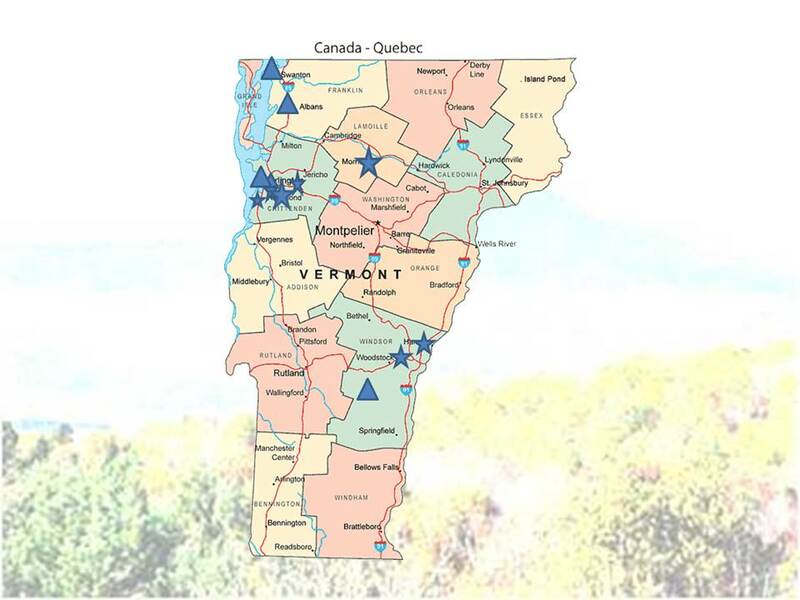 Most earthworm species found in Vermont have probably come into North America by early colonial trading with Europe. These worms are in the family of Lumbricidae. The new invaders are from East Asia and are in the earthworm family Megascolecidae. There are several Amynthas species in the North East. These species are usually called Jumper worms (Alabama Jumpers), Wrigglers (Jersey Wrigglers) or Snake Worms. It is difficult to differentiate among these species by looking at their external appearance. One needs to look at the internal organs of these worms to tell which species they are. The only Amynthas species found in Vermont to this date are Amynthas agrestis. Figure A2: Forest on left is earthworm free. The one on the right is invaded by Amynthas agrestis. 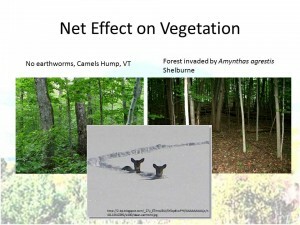 Deer may make the situation worse by browsing on tree seedlings because earthworms have reduced browse in the forest understory. by adding a blog comment which should include an address or the coordinates of where you have seen them. At your home look at mulched flower beds, compost piles, and adjacent woods. Other places where you might find them are nurseries and mulched beds in your local park, community garden and parking lot. I found them in the oddest places. For example, they were happily snaking around in mulched beds of a parking lot in Colchester and the ornamental beds of the Williston I89S rest stop. And yes, I have them at my house too and curse them every time I buy more mulch for my ornamental beds. They love mulch and go through it as though there was not tomorrow. Eventually you get wise and stop feeding them that mulch. Yes, they can decompose woody mulch. They stimulate the production of lignin decomposing enzymes (Figure A4). You even see them in decomposing logs. Figure A4: Peroxidase ( a lignin decomposing enzyme) activity in Pine (P), Spruce (S) and Cedar (C) mulch with A. agrestis (dark bars) and without A. agrestis (lighter bars). Here is when to look for them: The best time to find them is from end of June to mid-October (Figure A5). That is when they are most abundant. They hatch in April around these parts when temperatures have risen above 50 F for the first time but you won’t be able to see their tell-tale saddle or clitellum that stretches all the way around the circumference of their body (Figure A1) until they are adults. You can tell them even when they are still juveniles and don’t have that saddle. They tend to squirm a lot, move like snakes and sometimes lose their tails in an attempt to get away from you. Figure A5: Amynthas agrestis through the year. They hatch in April and die with the first frosts in Autumn. The first adults are seen in July. 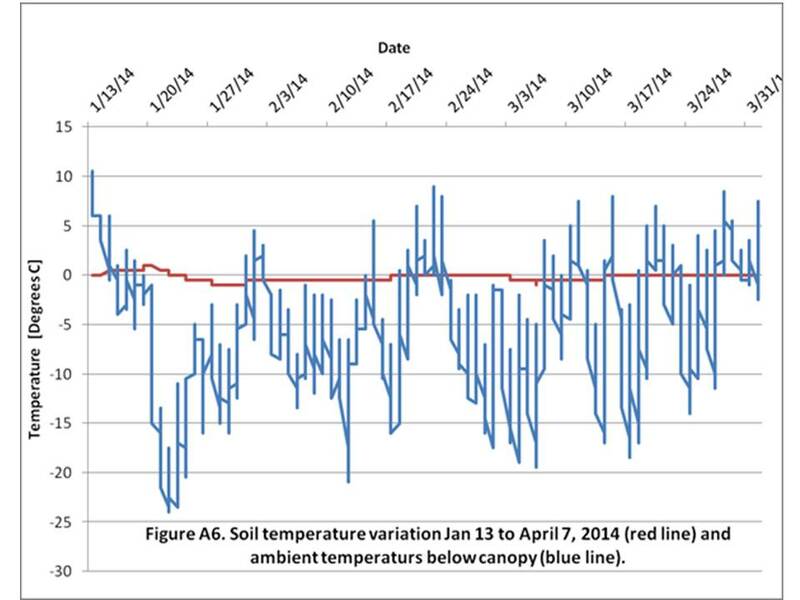 April 7 and 8, 2014: Last week we collected temperature data at the horticultural Research Center (University of Vermont) in South Burlington. 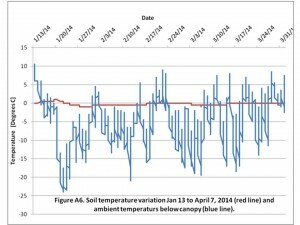 Soil temperatures stayed at or below 0 C from January 25 to April 1, 2014 (blue line, Figure A6) even though there were large swings in ambient temperature (red line). This was probably due to snow cover. Unlike in other years, the soil was frozen. Ice reached to a depth of approximately 4 cm. April 8, 2014. 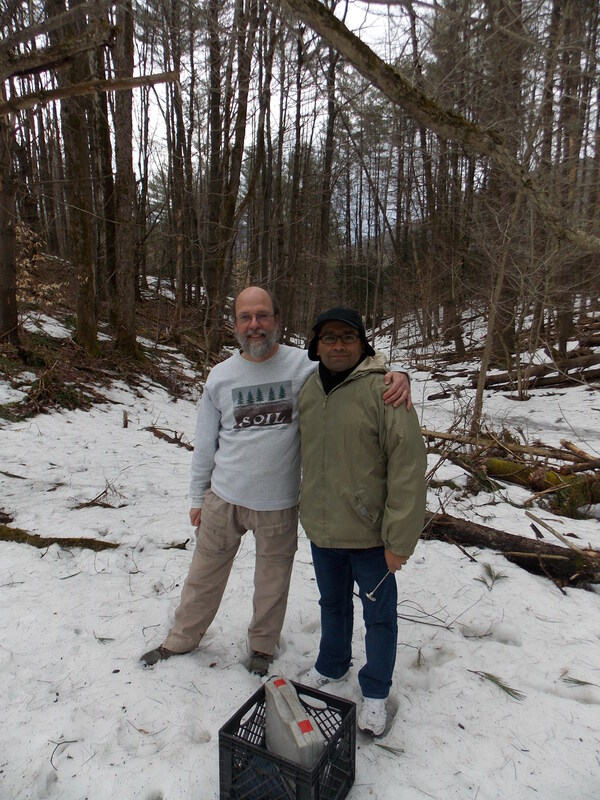 We went to an Amynthas-invaded forest site in Huntington where, to our surprise, we found a lot of potential hatchlings which are now being incubated in the lab at 15 C. We found them in the leaf litter both under snow and patches where the snow had already melted. Soils were still frozen and temperatures in the leaf litter were 4 C and under the snow 1 C. Ambient temperatures at 2:30 pm were 9 C. The suspected hatchlings were in water films on and between leaves. Pictures below shows Korkmaz Belliturk and Josef Gorres at Huntington today (picture credit: Naomi Cunningham). February 12, 2014. We counted the hatchlings from Huntington. We found 111 potential hatchlings on leaves collected from 6 quadrats that were 20 by 20 cm in size. That translates into approximately 400 hatchlings per square meter or 40 per square foot. Since collection of these hatchlings they have been growing in the cool temperature incubator. On February 10 we surveyed the invasion site at the Horticultural Research Center at UVM. 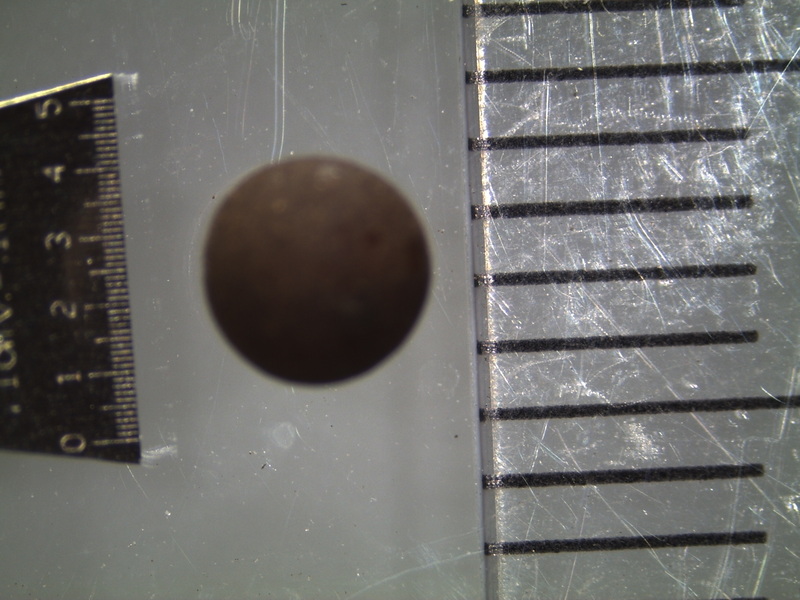 We only found 1 potential hatchling in 5 plots of 30 cm X 30 cm area. This site was dryer than Huntington. We are now back in the field season, collecting cocoons and hatchlings from the woodlands. As usual there is another bumper year of Amynthas earthworms expected in the woodlands we are surveying. Here is a map of confirmed Amynthas sightings in the Northeast. Your Amynthas populations is likely not on it since only scientist confirmed sites are shown. Dark gray shading shows the potential range of Amynthas as defined by climate. there may be other restrictions such as soil acidity, vegetation that may restrict the expansion. Circles indicate where Amynthas has been spotted by researchers. From Moore, J.D., Görres, J.H. and Reynolds, J.W., 2017. Exotic Asian pheretimoid earthworms (Amynthas spp., Metaphire spp. ): Potential for colonisation of south-eastern Canada and effects on forest ecosystems. Environmental Reviews, (999), pp.1-8. As you can see pheretimoids are quite widely spread in the region. Confirmed pheretimoid locations are shown as a circle on the map. You notice clusters of confirmed locations on the map. This indicates that there is a research group working on these earthworms in that area. Active groups are at the University of Wisconsin, University of Minnesota, Cornell University, Colgate University, Johns Hopkins University, University of Massachusetts, and of course here at the University of Vermont. When looking at populations of earthworms we are frequently just looking at the worms that we can see. There also is a more cryptic side of the population: cocoons. 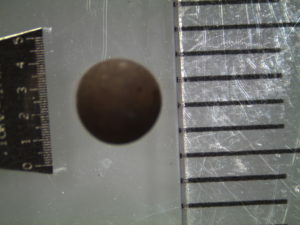 Cocoons are small, between 2 and 4 mm in size and difficult to see in the soil. You have to extract them laboriously (hmph!). But after you extract the scientific loot is great, you learn that there may be a couple of thousand cocoons per square meter, and that at any time of the year part of that cryptic cocoon population is ready to hatch. In an experiment started in June 2016 we buried in our woodland soils cocoons (contained laundry type bags) produced in 2015 and inspected them every month. We removed any hatchlings so there would be no additional cocoon production. Well, the outcome of it was that in July 2017 about 20% of the buried cocoons were still viable. — Bad — The cocoons may last through several winters which would make controlling these earthworms even harder. We have to repeat this experiment to make sure that our conclusions from that first experiment are valid. If they are then we are dealing with a cocoon bank that acts like a seed bank. On cocoons, check out this paper: 2017 Biological Invasions (in press). It says that these worms hatch in the winter when temperatures are high (e.g. January thaw). Here is a picture of a cocoon. the picture was taken by Maryam Nouri-Aiin, my current graduate student. Thank you a lot for sharing this with all folks you actually realize what you are speaking approximately! Bookmarked. Kindly additionally seek advice from my web site =). We could have a link exchange arrangement between us! I am a professional gardener in Chicago. All earthworms thrive on glyphosate. It’s an amino acid with a phosphate group attached. Nitrogen and phosphate drenching dead plants, their favorite food. Worms,pill bugs and sow bugs multiply where it is used, and then moles come in after the worms and bugs, so quickly that I think the smell of glyphosate attracts them. Tubidy mp3 indir: Youtube’da bulunan video klipleri mp3 indir ya da mp4 indir bağlantıları tubidy de ücretsiz. Hemen http://www.tubidycep.tk adresini ziyaret ederek mobil mp3 indirmenin keyfini çıkartın. Very nice article, i’m so impressed thanks for sharing such a wonderful post. Your are a great blogger, I’m so impressed with your post thant you have shared here, Thanks for sharing such great information with us. Your Post is very unique, infomative and and easy to read.Keep it up in future, thanks for sharing such a useful post. Harlequin Pointillist legs for Da Vinci’s Vitruvian Man, both dark and light and all in between. Suspended in a wheel of fortune in endless motion. Perspective detail 48 reveals much about how previously shown details fit together for the whole painting. More revelations to come. Egepen Dikmen gelişmiş hizmetiyle en etkin tasarrufu sağlayabilirsiniz. Pvc pencere ve kapı sistemleri çok yüksek ısı yalıtım değerlerini barındırır. 1 week ago I saw dozens of worms in the garden of my house. I was investigating how to get rid of them. Do you have any advice for me? Interesting. Most likely it is a different worm. There are some that are aquatic. I am not familiar with those species. Sorry. I have these in my back yard in Webster, MA in DROVES!!! Like, I dug in a 2ft square area and was literally grabbing them in HANDFULS! I use them for fishing bait. Had no idea they were an invasive species. Please visit me a href=”http://psy-flow.com/situs-judi-online-terpercaya/”>Situs Judi Online . Do you remember where in your yard you saw them. Which part of Burlington do you live in? Burlington is riddled by these earthworms. I find them in many places… Thanks for your comment. Find the best oncasino(http://www.99tnc.com) that can provide the safest game environment you can find and you can confidently log in to your account. While safe and legitimate casinos are still much more secure than unsafe casinos, this does not mean that you should not have time to do the right homework. You need to be completely sure that the information you enter into oncasino will be kept safe and secure. There are many things you need to consider when you want to search for oncasinos that meet your standards. You can add personal information and financial information to the casino by joining oncasino, where you can play real money. Now that you understand the safety of online casinos and how to choose online casinos, you need to find a safe online casino. Here is a link to http://www.99ute.com , one of the safest online casino sites. Bahis sitesi kiralama her zaman yeni bir site daha iyi bir site olması için araştırdık yaptık ve yapıyoruz.Yazılımcılarımızla daha yoğun bir tempoda çalışarak hızla istek ve talepleri istedikleri sitelerde uyguladık.7/24 bize ulaşım sağlanmakta olup istek ve talepleri yazılımcılarımıza iletip yapılabilir istekleri yerine getirmekteyiz.Sistemlerimizin hepsinde kullanımı kolay admin panelleri mevcuttur.Bu sistemlerimizde hiç bilmeyen biri bile olsanız zorlanmadan bu sistemleri rahatlıkla kullanabilirsiniz ve oyun oynatabilirsiniz.Zaten bir çok işlemi sistemlerimiz otomatik yapmaktadır sizlere genelde düşen görev çok basit işlerdir.Mesala oyuncuya sayfa açıp bakiye yüklemesi bakiye çekimi hesap kapatma kuponları takip etme gibi basit işlerdir. Kiralık bahis siteleri Dünyada ve Türkiye de hızla yaygın bir hale gelmiştir.Nedeni ise oyunculara birden fazla kolaylıklar sağlamasıdır.Bunlar başlıca her an gibi bir bayi ye ihtiyaç duyulmadan evden işten ve cep telefonlarında oynanabilir olması,oyuncuya birden fazla oyun seçenekleri sunması ve en önemlisi oyuncuları 3 maç 4 maç gibi kombine yapmaya zorlamamasından dolayı bu siteler günden güne oyuncuların ilgisini daha çok çekmektedir. Bu bahis siteleri gün geçtikçe daha da popüler hale gelecektir.Aslında yeni bir iş sektörü halini almaya çoktan başladı bile ve inanılmaz rakamların döndüğü bir piyasa oldu. Bu iş aslın da buyuk kazançlar da elde edebilirsiniz,ama en önemli etken bu siteler kapalı bahis sistemleridir,Bu yüzden biraz çevreye yada iyi bir oyuncu grubuna sahip olmalısınız.Yada ek gelir olarak düşük maliyetli siteleri kiralayarak işinizin haricinde kendinize ek bir kazanç sağlayabilirsiniz. Thanks for every one of your effort on this web site. Betty really likes doing research and it is easy to see why. We know all concerning the dynamic medium you offer rewarding steps via the web site and in addition welcome response from the others on this article and my girl is in fact being taught so much. Enjoy the remaining portion of the new year. You’re the one carrying out a glorious job. I live in Broken Arrow Oklahoma. Yesterday, (March 13th), I found over 150 of these worms. It was raining all day and the ground was flooding so the worms were being forced out of their burrows. Their behavior when you tried to pick them up freaked me out at first, but it also made me curious, so I started doing some research online. That led me to this site. I always thought seeing earthworms in your garden and yard meant you had healthy soil. Now I am concerned after reading this article. Is there a way to get rid of these pests? I am worried that finding over 150 worms in about two hours could mean my entire yard is infested. Do you have any advice? Keçiören haberleri sunan web sitemizi yanı sıra keçiören firma rehberi olarakta hizmet vermektedir. Karnınız acıktığında Yemek Denizi sitemizi ziyaret edin. Reyting sonuçlarıyayınlayan portalımız Kitap haberleride sunar. I am a professional gardener in Illinois in the greater Chicago area and I have been dealing with these little monsters in countless gardens including my own for years, although I did not know what they were until three years ago… looking for a remedy but have not found one. I am pretty sure on a small scale the following would work wherever chickens are allowed: use powdered mustard as a vermifuge then set the girls to work. Haven’t tried it though as I got busted for my chickens and never got the chance. Just putting it out there! More people should be talking about this very serious pest and they should never, ever be used as bait. They can survive a long time under water and using them in this way may contribute to their spread. Thank you for this very informative blog. This post is very informative with some unique content. we have so many of them in my back yard..! I have many. I had noticed something odd about the worms in my yard when gardening. I noticed the worms were basically jumping toward me when I’d be digging. This would startle me every time. Finally at noticing the size I googled it and found this article confirming my impression that they were not the typical worm. I had never had them before but do recall earlier this summer getting a bag of compost and finding a worm in it. Well that was the beginning. Now I just want these little bas..rds gone. I cannot enjoy gardening because they are constantly jumping out at me and scaring the bejezers out of me. How can I get rid of them???? I am afraid of my own yard! HI Barbara, Maybe turkeys like them.I am not sure. Good question. There is asexual reproduction in some of the earthworms. I should add: We are on upper Elm Street in Montpelier, Vermont. Unhappily, we spotted our first crazy snakeworm today at our community garden (www.thegardenat485elm.org). This is our fifth season and our first snakeworm. Hello! We just posted the following on our Garden Gossip FB page… Thank you for any updated predator info you may have confirmed. 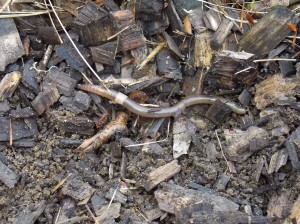 “Are you finding the “Crazy Snake Worm” in your garden mulch? Well, if you are, UVM wants to know it! Please read up on this very important issue… Thank you! We just learned recently, at garden club, we may have a natural predator for them. However, we do NOT have a *confirmed* one, as yet. They are hoping all of the holes we find dug in our lawns are that from Skunks actually eating these invaders! That would be wonderful, on one hand, but it’s kind of like being in a catch-22, as who wants an excessive Skunk population on the other? Lol! That is a great article. One should know that the casting layer of earthworms is full of their cocoons (egg casings). For annual worms these are their survival structures that protect their eggs (and thus their populations) from freezing temperatures and drought. I have a worm bin (Eisenia Fetida, aka Red Wigglers) I left outside this winter to see whether the cold temperatures of the Vermont winter would kill the cocoons. Or, do they survive and hatch when it gets warm enough like for pheretimoids (snake worms/jumper worms). I am still waiting for them to come back. For Amynthas agrestis and A tokioensis (two phertimoid species), we found that the cocoons survived to really cold (at least -24 C or 12 F). For some other species people have shown cold resistance to -40 C (same as -40 F). That is a good question. My answer is I am not sure. We have lots of these in our garden and notice that the nearby woodlot (mostly sugar maples) has a bare forest floor. There are lots of deer around, but the snake worm could possibly be the reason for no floor vegetation in the woods. North Bennington, Vermont. I have these in my back yard! Like, I dug in a 2ft square area and was literally grabbing them in handful. I often used them for fishing bait. Ironically enough, all earthworms thrive on glyphosate. It’s an amino acid with a phosphate group attached. Nitrogen and phosphate drenching dead plants, their favorite food. What’s not for a worm to like? Worms,pill bugs and sow bugs multiply where it is used, and then moles come in after the worms and bugs, so quickly that I think the smell of glyphosate attracts them. We have the rapid large above ground worms here in Brattleboro VT. Thanks for the information. Most of the earthworms in N America are exotic imports. There were a few natives species left after the ice age in places like Vancouver Island. However, the common worms that most of us are familiar with are European and Asian imports. Hi, I just hard about these snake worms and suddenly I see them every where in my yard. I was raking away pijne needles and tree leaves and under a layer of maybe 3″ but very damp it was just scary to see all of these crawling worms. Non had heads like in the video but they all looked like the worm in Fig.1 with the light colored band. just picked my last potatoes and they were also in the potato bin. No potatoes out of that one I guess. What do I do with them. I am close to Philmont, NY 12534 8 miles eats of Hudson, NY. When I removed newspapers I had used to mulch around my tomato plants just now I found many snake worms. These are deep, wood-framed raised beds to which I had added only compost from a reputable company. How did they even find their way in there? I also found them when I cleaned up a perennial shade bed this afternoon. I’m in town, in Montpelier. I live in Saugerties NY which is in Ulster county.The Master gardeners of Columbia-Greene counties (neighboring counties) recently canceled their plant swap on Oct. 7 because of these earth worms (Amynthas agretis). I started noticing a lot of “earth worms” first in my compost bins and then in my vegetable beds. I have also noticed that most of my soil now looks like worm castings. I use a lot of local leaves in my compost and I assuming that is how I acquired them. I garden in the Catskill Mts of NY near Kingston. This is the second year of a noted large population. I use them in large compost piles to make dirt. They are efficient. Very cold winter temperatures seemed to kill them off about 4 winters ago and they are just rebounding. I do not really see them in wild forest here, mostly in garden beds and mulch piles. I believe they did contribute to a bad seed germination in my veg beds. I rather love how fast they make castings- I am not aware of oxygen depletion issues. Will read up thanks. We have lots of these in our garden, and notice that the nearby woodlot (mostly sugar maples) has a bare forest floor. There are lots of deer around, but the snake worm could possibly be the reason for no floor vegetation in the woods. North Bennington, Vermont. Sept. 2017. I have found a number of these this year in my garden and grass. I think they came with my last delivery of wood as I have never seen them before this summer. They startled me and I have been capturing them and then putting them into a vinegar bath but I am now going to put them in an alcohol bath to keep a better specimen. I had heard something about them on Vermont Public Radio and then found this page as I wanted to identify them. How do I get rid of them? I live in Craftsbury. The wood came from somewhere in the NEK from Albany loggers. I have observed a very large number of these “crazy worms” at my home in Peru,MA. I have noticed them in past years but this year they are truly prevalent. I collect worms for fishing quite often and do not see “normal” earthworms on my property anymore. I never dreamed they were an invasive species! Have identified them at Dogwood Drive, Leicester, which is on Lake Dunmore. I believe they arrived in a nursery plant growing in compost-laden soil. Although I do shop at Rocky Dale in Bristol (see earlier comment re: Rocky Dale), I suspect the culprit in this case may have come from another nursery, but no way of knowing at this point. Perhaps an emergency BOLO publication is in order for the local nurseries! Also, can you provide info about identifying their cocoons? We have these worms all over our yard, mulched beds and paths in Montpelier on Harrison Ave. we are guessing they like our mulch. There are casts everywhere and We can’t rake or dig without unearthing many worms. Vegetable seeds planted never germinated or sprouted slightly only to disappear completely in a day or two. We wonder if the worms are the cause. We plan to replace the mulch on paths with stone, but would love ideas about how to begin to control the worms and options for keeping flower beds looking attractive without attracting more of these worms. I was finding these worms in Morris county new jersey as early as the mid 70’s. They were in an unattended mulch pile of leaves and pine needles. This year, they are everywhere in my yard in pike county pa. Even pushing up dirt (coffee grounds) in the driveway. Scrape the dirt, there’s a jumping worm. This now seems to be an infestation, which I believe was introduced by a mulch delivery. I live near Lake George, NY in the Adirondack Park. I saw a few of the Amynthas agrestis worms (Asian jumping worms) two years ago in my small vegetable garden and also a few in my two 3′ x 3′ wood-sided compost bins. This year (summer 2017) I have still only seen a few in the veg garden, but am now seeing at least a couple of dozen in each of the two compost bins! They are on average about 10″ long and jump around a lot. Just chiming in to let people know where they are and that they are multiplying very quickly. Am raking leaves today (9/16/17) in our yard in Montpelier, 3 Sunnyside Terrace, adjoining the woods by Hubbard Park, so we have lots of dead leave coverage at the side of the yard. When I get into this, there are “nests” of these big worms, 8 or 10 or more uncovered at once, some almost a foot long, move very fast in a snake-like wiggle, banded, etc. Have lived here a dozen years, never seen worms like this, and there are probably hundreds of them around our yard and in the adjoining woods! Kinda freaking me out, man! I’m afraid we may have quite a few of these in our yard in Montpelier on Marvin Street/Bingham St. I’ve only recently learned about them but I know we have tons of big worms. I confirmed one the other day that had the distinctive light band around it. Wondering if chickens would eat them? I very much appreciate the time and effort you put into writing this very informative article. I am currently trying to compile information about the Amynthas issue for the New York Master Naturalist program and I was wondering if you knew any good sources for maps showing the current distribution of Amynthas spp, preferably for New York but any good maps of the Northeast would work as well. I have been a bit absent from this site. I apologize. Lots of interesting comments . So here are some of my comments to the posts. Chang, Chih-Han, Bruce A. Snyder, and Katalin Szlavecz. 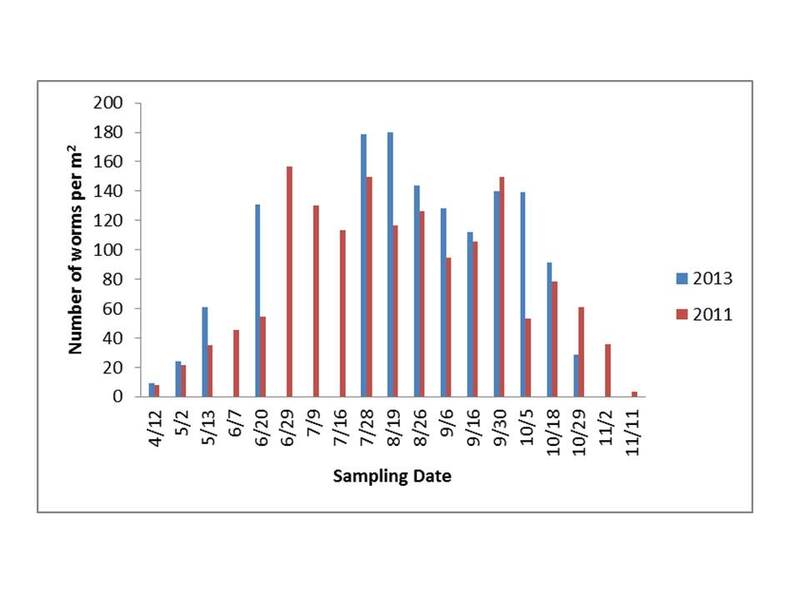 “Asian pheretimoid earthworms in North America north of Mexico: An illustrated key to the genera Amynthas, Metaphire, Pithemera, and Polypheretima (Clitellata: Megascolecidae).” Zootaxa 4179.3 (2016): 495-529. 2. 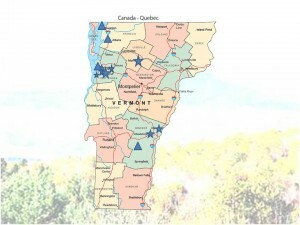 I am not surprized at all the sightings in and around Vermont that you have reported on. We are getting more and more reports through either the UVM plant clinic or by e-mail. They are ubiquitous in gardens now it seems. Plant material, leaf mulch, compost and maybe wood mulch may be vectors. Potter, Daniel A., et al. 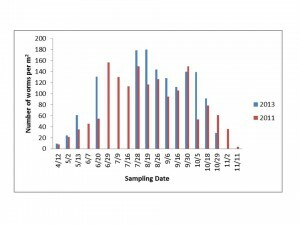 “Managing earthworm casts (Oligochaeta: Lumbricidae) in turfgrass using a natural byproduct of tea oil (Camellia sp.) manufacture.” Pest management science 66.4 (2010): 439-446. Potter, D.A., Redmond, C.T. and Williams, D.W., 2011. 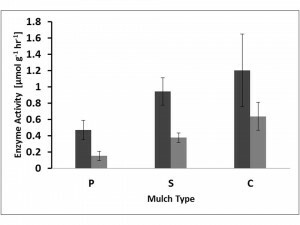 The worm turns: earthworm cast reduction on golf courses. GCM. September, pp.86-96. You should know that there are no approved pesticides for earthworms… and that the tea oil product is a molluskicide. It irritates these and other earthworms as well as snails and slugs and it kills them if they get enough of a dose. Even if you applied this, it does not take care of the problem entirely because the egg casings (aka cocoons) are very resilient and the embryos developing inside them may not be. We are working on biocontrol agents right now but there is no funding at any government level for this and thus that research is uncertain going forward. Any funding anywhere!!!??? However, we have isolated a bacterium and a fungus that seems to be effective against the worm form. Interestingly my graduate student isolated one of the agents from cocoons in which the embryo had died. Don’t use Sevin… You may have other effects with that. Again it may not act on the cocoons and it si not an approved vermicide. 4. I love the comment on how far back these worms were observed at Sunset Lake. 30 years ago. I believe it. Richardson, J.B., Görres, J.H. and Friedland, A.J., 2016. Forest floor decomposition, metal exchangeability, and metal bioaccumulation by exotic earthworms: Amynthas agrestis and Lumbricus rubellus. Environmental Science and Pollution Research, 23(18), pp.18253-18266. Hasn’t killed those Turkeys yet. Yes moles and birds will feed on these but generally there are too many too eat… Maybe they are not very tasty. IN order to wiggle so frantically these worms have to accumulate lots of salts in their body creating high hydrostatic pressure. May be that leaves a nasty after taste (LOL). The latter is technically not in the Amynthas genus, but it looks the same, wriggles the same etc. M. hilgendorfi are really large worms, >5 inches long. 8. We counted cocoons the last two years. There are over 2000 per m^2 in some places. That is crazy a lot. And some of them are surviving at least a second winter. Could this be a cocoon bank, analogous to a seed bank. Not sure whether they survive more than two years. Haven’t done that experiment yet. I believe we have these in Brattleboro (Chestnut Street, just east of I91.) Stick a garden fork in the yard and they shoot out. Corner of Lost Nation Rd and Whitney Rd, East Fairfield VT. Black Creek is located parallel to the property, which I live on. Finding them heavily in areas of tall weed and grass growth, living in the tangled mess of last year’s vegetation on the ground. Especially at the edge of our lawn. Your Eco biology Dept. Did a study hear a couple years ago. We have been doing extensive work in ditches and gardens around the upper west shore of Lake Iroquois in Hinesburg and have been finding a lot of these worms across multiple acres, both in the wooded areas and in our yards, gardens and ditches. At first we were happy, thinking they were healthy earthworms. 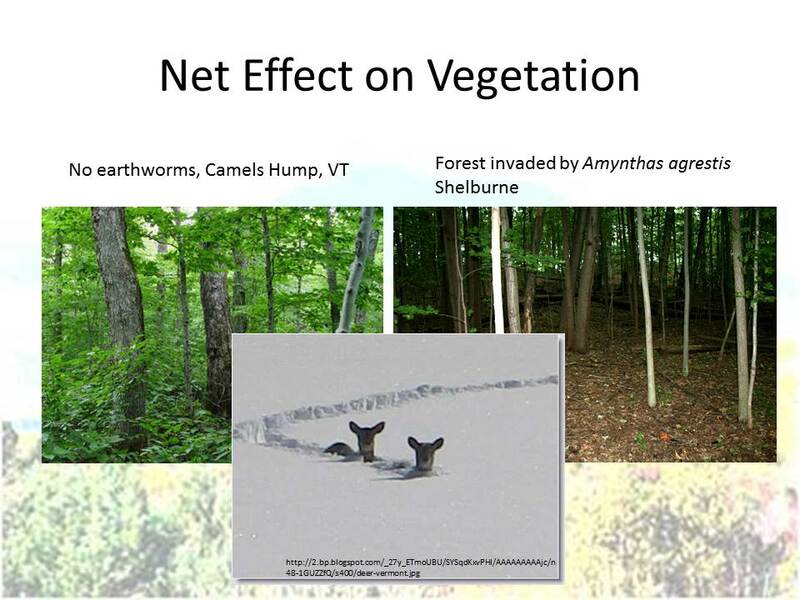 Then the Vermont Youth Conservation Corps, who is helping with some of the work, educated us on the Crazy Snake Worm and we found this article when we googled it. The worms are very prolific here so we are interested in any suggestions about eradication or containment. Since posting my observation on Charlotte’s Front Porch Forum other Charlotte gardeners have confirmed that they seem to have taken up residence here. One gardener noted they were easily found in his garlic beds and it made me realize that’s where I’ve found them, too. I used to mulch my garlic until I realized slugs were attracted to that environment and would emerge to chew around both hardneck and softneck garlic, easily and quickly destroying the crop. So this season no mulch but the beds are already rich in composted material from years of trying to lighten our Vergennes clay (cement) soil. I’ve already harvested 2017 garlic but after the next good rain I’ll be happy to go out and collect several Amynthas to donate to science at UVM. I don’t know if there’s any connection (to Amynthas invasion), but I don’t think I’m seeing anywhere near the number of night crawlers in lawn and garden. It used to be that night crawlers were all over the garden soil nights when the temp and humidity were conducive, now they’re scarce. by the description, they sound exactly like the worms we used to find in the shore line leaf mulch along the late where are camp was ..Sunset lake in Benson. at least more than 30 years ago.. they would look like nightcrawlers but wriggled a ton and often broke apart..we’d use them for fishing if we ran out of worms..but they had very brittle bodies. seems like a perfect match to me.. but since then the neighbor has taken better care of that mulch pile and it’s no longer there.. could they have been here that long? Found one in my garden in fairfax Vermont. Has every thing been said that can be said about Amynthus agristis? How about the turkey connection? We have plenty of these little beasts (the worms) in our vegetable garden which is located only about 150 feet from the edge of the sugar woods. In that woods are areas that have been all scratched up by the turkeys. We often see mobs of 30 or more wild turkeys. I believe they may be feeding on the worms which probably come right up to the surface to see what all the scratching is about. But, I’m afraid the worms out number the turkeys. connection? What do you think? Another thought: we had very poor germination in our sweet corn in 2016 and some plants that came up an inch or so, lay wilted and dead on the ground. I am a farmer and am well aware of crows and chipmunks, but this is different. We mulch our garden with old hay and the worms absolutely love it. Humm. Our farm is in Cabot. Found 1 in Monkton Vermont. Definitely a snake worm. Could have been the one in the video link on your page. Is there any way you could send me an email, so we could talk about your research? 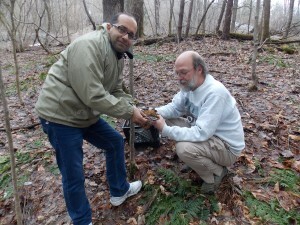 I am proposing a field research project this summer on the effect that Amynthas agrestis has on tree seedlings and ecosystem consequences, namely soil nutrient levels pre and post invasion. We are going to study four different soil types and wanted to talk with you about how to procure some worms for our research. I am the Forest Pest Outreach Coordinator at The Morton Arboretum, Lisle, IL. My email is included, I hope we can connect to discuss our research. Pretty sure I found these in one of my raised beds and under my hot compost pile a couple weeks back, located at 161 North Union St in Burlington. I’ll double check when I have a chance to confirm. Found at 389 Quarry rd in Washington, Pennsylvania on this date and time… moves like a snake in water and on land, has rigid rings on body, unlike earthworms, and fell apart while being handled… I am astonished at this find!!! I found these worms in my plot in our community garden at North Branch Nature Center in Montpelier, VT, last fall. This year there are copious amounts of them. I gathered at least a hundred in a bed the size of 1 by 3 meters. I am going to stop using leaf and newspaper mulch for the winter and rather try covercrops. I would love advice on how to minimize their presence and help stop their spread into the forest. I’ve also seen these crazy snake worms at my home in Framingham MA. I have a patio that I was trying to clean up because of growth in between the bricks and when I started scrapping between the bricks these worms started coming out of the bark mulch that surrounds the patio. They were aggressively coming at me. I jumped up took a rake and flung them into the grass and moved to the middle of the patio to get further away from the edge. It happened again and I stopped because as soon as I made sound they came at me and I had to jump back, grab the rake to scoop them up to remove them from the area. Because they weren’t behaving like ordinary earth worms I did a search that got me to this site. If there is a way to get rid of them please let me know. This has also taken a toll on my grass. Does it help to remove the bark mulch and not use bark mulch at all? We have them in Rochester Vt, they were freakin’ me out when I was pulling up flax. Big sumo thrashing-around worms, ick. Probably came in on cow or horse mulch. If you find a way to kill them off let us know! I have had these worms for years and knew they were not the large nightcrawlers that we used to use for fishing.They have turned my soil into crumbles of dried dirt that has no water retaining ability. My raised vegetable garden is decimated of any organic matter and is almost like trying to garden in concrete. I would love a solution to rid my soil of these worms. For years, no one knew what I was talking about until the guy that runs the Maine Botanical Garden (can’t remember his name) wrote an article about these worms and said that they were more worrisome than the extinction of the honey bee. They are a curse to gardening! I believe that my Chicago (north suburban) garden is infested with these worms. I find them under the mulch on certain garden beds and under the large bark pieces I used on woodland paths and around the base of two maple trees. They do not appear in my vegetable garden. I can’t find any information about their occurrence in Illinois, nor methods to combat them in my organic yard and garden that contains areas of woodland and prairie wildflowers, five on-ground compost piles, lawn, ferns, vegetable and herb gardens, etc. Please let me know of any advice you may have, and thank you for this article. In late July this year my lawn suddenly started wilting, and it looked like the grass clippings I’ve been leaving on the lawn when I mow were killing the grass. I’ve been following my organic lawn care co’s instructions (mowing high, leave clippings on, throw on new grass seed, water) so I was not happy with all these dead spots in my lawn. The lawn care company suspects “snakeworms,” and they may be right. As I pulled out a plug of crabgrass very large worms were on the surface. I guess that could explain the sudden die off. What to do? Our Nature Center here in CT gave a lecture on these crazy snake worms, and when someone asked how to rid the garden of them, he said sevin dust could be put down end of March or early April when the young ones emerge. Do you have another suggestion? Most of the worms at this point in the year are about to mature. I guess another week and you have the first that are able to reproduce. It is difficult to determine the species. You need to cut them open and check where the organs are, how many of certain organs there are and what shape they are. Not easy without a microscope and a dissecting kit. There are somethings you can try. For example heat the soil with black plastic sheeting. There is also a fertilizer that seems to be anirritant to them that may lead to their demise (its called Early Bird). The liquid version seems to work even when diluted 1 part to 20 parts water. Hm, good question. I don’t know the answer to that. Amynthas lives close to the surface and moles mainly below the surface. Moles will eat earthworms. Not sure about Amynthas. These earthworms will die at 100 F or so but it is unlikely they stay in place in a hot pile. The move quickly and likely they will find a spot near the surface of a compost pile that is closer to ambient temperature. We know cold has really no effect on the hatchlings. How do you thing the worm would handle the 135-140 degree temperatures required for the USDA APIHS testing? I believe I have the Amynthas Agrestis in my East Hampton, Connecticut yard. I recently completed your survey on Amynthas agrestis. Are the moles in my yard and gardens likely to eat the AA? I’ve been finding Crazy Snake Worms in my gardens for the last few years (I live on a wooded lot in North Gorham, Maine and have extensive shade gardens with perennials, shrubs and trees. I was holding one to show my husband the other day and it reminded me of a leach the way it’s end was behaving. I was planting a perennial this summer and when I pushed my shovel into the ground one of these earthworms literally shot vertically out of the ground and was airborne!!! I’ve never seen such a thing! I was speaking with a friend in Gray, Maine yesterday who has similar earthworms in his gardens. I’ve read about invasive earthworms that can alter entire ecosystems because of the way they burrow and the speed at which they consume organic matter. Is there anything I can do to slow their infestation or has Pandora’s Box been opened and it’s too late to do anything to control the population? I sighted of which I believe to be a (Amynthas Agretis) Snake Worm. I had never seen such an aggreseve animal resembling a night crawler! It was wrigling down a hot sidewalk at probably in access of 110 degree F if not more. I attempted to pick it up, to help it back into the grass. To my surprise! It quickly sprang from beneath my finger at a high pace or wrigle! It took off down the hot sidewalk! WOW! I had to check this wild little creature out. For sure! Not a night crawler, or what I know as a common earth worm. I cautiously fallowed, and observed. It had no apparent head, so I assumed it was not going to bite me, so I attempted to pick it up again. It jumped! It wriggled frantically! It fled away couple more times. Finally got hold of it! It was so strong I could hardly keep it between my thumb and index finger. I quickly pitched it into the grass lawn along the sidwalk! It just as quickly vertically vanished into the lawn. This observation, was in Escondido, California at the corner of Ash st. & Valley Parkway. That little critter really got my curiousity up! WOW ÷).??? Any updates on the growth of the worms since your note of May 3rd? We now have people who say that they have seen A. agrestis in various communities in our area in the past, but I don’t know how they determine the genus and species, so more research is indicated. Those are really good questions. I am incubating some juvenile earthworms found at a site with Amynthas agrestis that are very small (2 cm) to see what they really are. If these are A. agrestis then you can forget the 50 F figure because we found them in meltwater between leaves. The temperature there was 38 – 40 C.
Good question too about whether these earthworms die when it gets colder. May be the juveniles have other defenses against the cold, maybe some salts in their bodies that depress the freezing points. Just a speculation, no fact about it at all. I will know more when the incubations are successful and I can identify these earthworms. Lets see maybe in three weeks we will know more. For the crazy worm to hatch, does it just need to get above 50 sometime during the day, or is there a certain number of hours for which 50 degrees needs to be exceeded? Also, what happens if, it say, gets to 60, but two days later, it gets down to, say 26? Do the hatched worms die? We have 5 days in a row above 60 and then 3 days in a row where the highs/lows were 42/26, 37/18 and 52/27. I am going to conduct some experiments with a fertilizer that contains some saponins that have been detrimental to other earthworms. I wonder whether this product is going to be effective on the crazy snake worm. I let you know if it works. I have to wait a couple of months before I try that control strategy cause they are just hatching now. Temperatures are spiking about 10 C (50 F) which appears to be the trigger temperature for them. It could be that soils need a few days longer to reach that temperature after the atmospheric temperature goes beyond 10 C. When they first hatch they are very small thread like creatures. Difficult to find. So we wait for the experiment till they are 3 to 6 cm long ( 1- 2 inches). I keep you in the loop. I live in the Redstone Quarry section of Burlington. Last year I put a lot of mulch in my raspberry patch and that is where I have most noticed them. After reading your article, I will remove the mulch and try to remove the eggs as soon as I can this spring. I first noticed these worms in my garden two summers ago. I am very afraid of snakes and noticed that these “night crawler” sized worms were acting like snakes. My friends at first thought I was just being paranoid but then they saw them. They tend to hang out in taller grass or as your article mentions, mulched areas. I would like to try to get rid of them but will probably need to enlist friends who don’t have my fear. If there is something else that I can do, please let me know. I live in Burlington, VT.